Co-captain Jackie Friedman ’16 attributed the team’s defensive success this season to the familiarity of the defenders with one another. Additionally, Friedman identified the team’s midfield as instrumental in supporting the backline. On the offensive side of the ball, the Big Green failed to score for only the second time so far this season, out of nine games played. Despite a flurry of 23 shots, Dartmouth did not find the back of the net, even with the two extra overtime sessions. Co-captain Lucielle Kozlov ’16, who is currently tied for the third-highest goals per game average in the nation with nine goals in as many contests, created some of the Big Green’s best opportunities in the game. With two minutes left in the first half, Kozlov found an open lane toward the net and took a shot from just outside the box that Brown goalkeeper Christine Etzel was not able to control. With Etzel down, Brittany Champagne ’18 had an open look at net, but after rushing to corral the loose ball, Champagne’s first touch was a little too strong, sending the ball right of the goalpost and out of play. 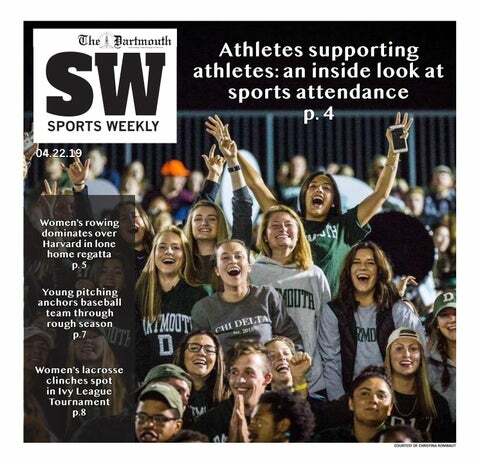 Fifteen minutes into the second half, Melanie Vangel ’18 had a great opportunity to put Dartmouth ahead of the Bears. After tracking down a leading pass into the penalty box from Kozlov, Vangel managed to elude her defender with a crisp cut to the right. With a solid look at the net, Vangel took a shot across her body that rolled just outside the left goalpost and barely missed giving Dartmouth its first goal of the Ivy season. Vangel provided a spark off the bench, leading the team with five shots and two shots-on-goal in 78 minutes of action. “I think in the beginning we were struggling a little offensively, but there were definitely a lot of periods within the game in which we started working together a lot better,” Vangel said. “We had so many shots that were just wide or too far out and just unlucky.” Vangel and Lauren Lucas ’19 both came off the bench for the entire second half and the overtime sessions. Head coach Ron Rainey said he will look to continue giving players on the bench opportunities to log substantial minutes on the field. “We’ve been lucky that we’ve been able to entertain some different people up top in the second half of the games,” Rainey said. With the draw, Dartmouth earned one point in the Ivy League standings and now sits tied with Brown for fourth. The Big Green’s six wins and one draw from its non-conference schedule give it a .778 win percentage, which ranks only behind Cornell University (8-0-2, 1-0 Ivy) in the League. While Brown’s overall record of 3-4-1 is not as strong as Dartmouth’s, Rainey acknowledged the strength of the Bears and the parity of all teams in the Ivy League. “[Brown is] a great team. I think the entire league is pretty equal,” Rainey said. “When you look at some of the results from top-to-bottom, you’re going to see times in the league when the top team has a tough match with a bottom team, and the middle teams can beat anybody on a given day.” While Friedman said the team has enjoyed success in the first half of the season, she believes the team will have to prepare for an added level of intensity in Ivy League contests. “There’s nothing like playing Ivy League games,” Friedman said. “Everyone shows up pretty much to get out there and kill each other, so while the non-conference games gave us confidence, they might not have directly prepared us for the level of physical intensity that Brown brought.” In order to ensure that the team has the mental toughness to compete in the Ivy season, the Big Green has created a mantra to guide its efforts in practice and games. “Our [mantra] is ‘All In, No Excuses, Win the Day,’ and we decided that at the beginning of the year,” Vangel said. “We remind ourselves of it not only every game, but pretty much every day.” The Big Green will play its next conference match against Princeton on Burnham Field, where it will look to continue its 22-match unbeaten streak at home that dates back to Oct. 2012. The match will kickoff at 7 p.m. on Oct. 3.